The partnership law enables you to set up a trading vehicle where only one partner can be liable if things go wrong. This Professionally drawn agreement is very flexible, so that you can easily edit it to suit the arrangements you have in mind. It is used most commonly for high risk ventures in property, finance, mining or research, or for ventures abroad, where there may be political risk. A limited partnership enables a single partner to carry the liability. 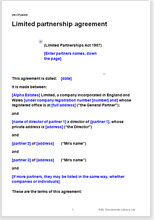 That partner may be a limited company with little or no assets, so preserving the assets of other partners. Often, all partners are companies. The registration requirement is very light. Secrecy can be maintained.